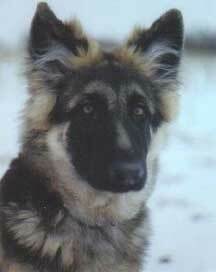 Can you get a long haired GSD from a dam and sire that are not? I have a four month old registered GSD that appears to be a sable long haired GSD. His mother and father are not long haired. Is this possible, or is he still wearing his winter coat? Yes, it is very possible that 2 short haired German Shepherds have puppies that are long haired. In fact, this happens quite often. In order for a puppy to be born long haired, solid black or solid white, both GSD parents must carry the recessive gene for this (Long coat, solid black or solid white) to occur. That is why long haired puppies can come from shorter haired parents - so somewhere back in the lineage of both parents there is a long haired German Shepherd (aka: coated German Shepherd) and many family members that are carrying this recessive gene all down the line. You can read more about The Coated German Shepherd here.